-Easy to get baby in and out with unique, adjustable side openings. -Baby can ride facing in or out. -Adjustable hardware ensures proper strap positioning for ideal weight distribution. -Head support moves up or down for best age appropriate baby posture. -Fine fabric, advanced hardware, superior design, superb construction for you and baby. 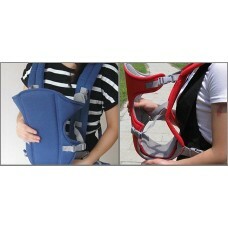 -The carrying capacity is 3.5-12kg approximately 4-12 months. -Promote closeness and essential bonding between you and your baby. -Nurse in privacy without removing baby. -Baby carrier help position the baby comfortably and at the same time provide the proper support for the infant's spine and hips.